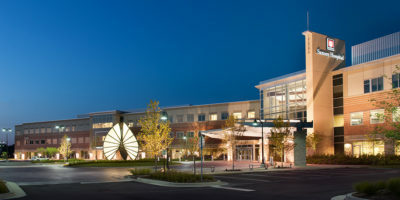 Johnson Development was selected by Indiana University Health to develop the medical office building to be located on the campus of the new IU Health Saxony Medical Center in Fishers, Indiana within the buildings are a number of IU Health tenants including community and academic physicians. Physicians will be offered the opportunity to invest in the ownership of the building upon completion. Johnson Development served as developer and will serve as property manager upon completion. Additionally, Johnson Development is serving in a project management role on the hospital and campus site work. During the planning and design, the project changed dramatically as the attached medical center evolved from an ambulatory surgery center to a 40-bed acute care hospital. Johnson Development’s flexibility and commitment to a seamless design and delivery process across the new campus was critical in keeping both the MOB and hospital on track through very challenging economic conditions. As a greenfield project, the MOB, hospital and site included economic development incentives and tax increment financing.